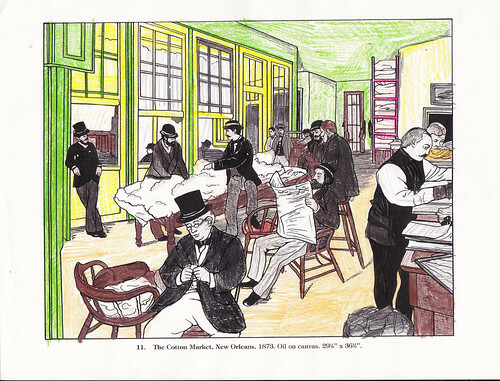 Should you use coloring books as part of your art appreciation and artist study? The debate still goes on about coloring books and art appreciation. In our family they have been a valuable tool that is a supplement and enhancement to our art time (read my views in full in this post: Harmony Art Mom-My View on Art Appreciation using Dover Coloring Books). I expressed my personal view of coloring books several years ago and I haven’t changed my mind. They are something our family enjoys using as a follow-up to our artist study. This post though is about a particular Dover coloring book that has been the centerpiece of our art appreciation over the years. In fact, we have owned several copies of this coloring book as each child works their way through the Harmony Fine Arts plans for art appreciation. Please note that there are affiliate links in this post. Markers do not bleed through the thick paper. Small illustrations in color for each painting in the book make it easy. We are looking forward to a Modigliani study next year. Each artist and painting has notes in the index. Our family gives this particular Dover Coloring Book a huge thumbs up. I encourage you to get your family a copy to have on hand as a reference and as a way to follow-up to your art appreciation. Further ideas can be gleaned from my Dover Coloring Book on my HubPages. Last week I announced a giveaway for Color Your Own Degas Painting and a set of markers. There were 37 entries and my son helped pick a winner. The winner is Jennifer Gregory Miller. Congratulations and please email me with your mailing address so I can get your book and markers out to you in the mail this week. Also, sending a big thank you to all who participated.